Turn off your computer before cleaning! Cleaning the laptop cooling system can cause the dust buildup trapped in the heat sink to become trapped in the fan and cause it to stop working. After cleaning the cooling system YOU MUST ensure the fan is functioning properly or damage can occur. Removal of dust bunnies within the fan chamber is required. Cleaning a laptop keyboard has its dangers as the keyboard keys are attached by very small, very fragile plastic clips. If you break these clips you will have no choice but to replace the key/clip or keyboard. Applying too much pressure to an LCD screen can damage it. Cleaning an LCD with a dirty cloth can scratch it. Cleaning an LCD with heavy duty cleaners can damage the gloss material. Ammonia Free glass cleaner deluded with 50% water is recommended. If you are not careful, cleaning your computer can also damage your computer! Reading our guide is meant as a reference to cleaning a laptop and is not fool proof. Take Your Time, Know Your Limits or Take It To A Pro! Over time laptops become dirty both on the inside and out. Cleaning your laptop not only helps keep it looking its best but also helps avoid costly computer repair bills down the road due to clogged cooling systems. In this guide we will focus on three areas of a laptop that require cleaning to help keep the laptop running its best. Unlike their bigger brother the desktop, laptop computers are made to be as small as possible to meet the portability needs of the user. Because of the small design only the minimum cooling space and hardware can fit and laptops can easily over heat when the cooling system becomes clogged with dust, hair and other debris. A laptop’s cooling system in most models comes down to two critical parts. Heat sink- Used to remove heat from devices such as the laptops GPU and CPU. Fan- Used to blow cooler air over the heat sink which then exhaust out of the laptop. How It Works: As the laptop runs, heat is created from chips on the motherboard. The heat sink sits on top of these chips and draws the heat off the chips and moves it to the heat sink radiator. The heat sink radiator is much like a car radiator with little fins that hold the heat until the fan blows cooler air over it. As the cooler air makes contact with the fins it removes the heat and then is blown out of the laptop as warm air. This process is repeated over and over as the laptop runs. In time the heat sink and fan will become clogged from the dusty air that is used to cool the system and as they do the cooling potential of your laptop is reduced. If the cooling output becomes too low, the system will no longer be able to keep itself within a safe temperature and problems or damage will occur. Given the above information I’m sure you can see our goal in cleaning the laptops cooling system is to remove the dust buildup and restore the cooling ability of the laptop. To do this we will start by determining the location of the cooling system and the air flow direction. On most model laptops you will find the fan or fans located on the bottom of the laptop, it will be protected by the plastic bottom of the laptop but the plastic will have air vents to allow for fresh air to be drawn into the fan. If you have found that location on your laptop you should also see an exhaust vent on the side or back near the same location as the fan inlet vent. On most model laptops if you take a flashlight and shine it inside the exhaust vent you will see the heat sink radiator. Although it will appear clean on the side you can see, the side the fan blows on is where the dust builds up. To clean the heat sink and fan you will reverse the airflow which will break up and free the dust buildup. To do this take a can of compressed air with the straw inserted and while releasing the high pressure air move the straw/air flow up, down and side to side within the exhaust port. As you do this you will notice a good deal of dust and debris coming out of the air intake port. Continue short and long bursts of the air and keep moving the straw to help the air break up the trapped dust. After you stop seeing dust coming out of the laptop we need to ensure there are no dust bunnies now trapped within the fan itself. Grab your flashlight again and look inside the vented plastic on the bottom of the laptop. In most cases you should be able to see the fan blades which you want to check for buildup after the heat sink cleaning. Should you find any type of buildup, it needs to be removed and this can be tricky. We find the use of a small straightened paperclip with a hooked end allows us to get between the plastic grill and helps remove any final hairballs or dust left over but be careful not to hook the fan blades or wires within or damage can occur. After the cooling system has been cleaned it is always a good idea to start the laptop and make sure you hear the fan spins as it should. Should you hear strange noises or no fan at all, the laptop should be powered off immediately and further cleaning of the fan and heat sink performed. Laptop powers on but powers off after running for a short amount of time. Laptop fan sounds loud or shows signs of slow running. Laptop fan runs on high non-stop. Just like the cooling system, laptop keyboards start to become clogged with many of the same things and over time this can cause problems to the overall use of the laptop. Keyboard see more use than perhaps any other part of the laptop and because of this become dirty quickly. The dirt on keyboards can be many things from dust, food, hair and sticky drink residue. Start by applying compressed air in between the rows of keys to free up the trapped dust and debris from under the keys. As with the cooling system, changing direction and angle of air flow helps break up the debris. Although you want to have the air pressure as close as possible to the keyboard be aware of the distance and avoid making contact with the keys or you may snap one off. After all the dirt from under the keys has been removed start cleaning the keys themselves with a lightly dampened cloth or paper towel. At Waco iPhones we use a mild store cleaner that we then delude with 50% water. When cleaning the keys, TAKE YOUR TIME! One mistake can cause you to lose a key or even keys. It is best to work with one key at a time and be aware the cloth or wipe can catch underneath the key and pull it free…To avoid this, take your time and focus on the task at hand. After the keyboard keys are clean, complete the process by cleaning the palmrest and touchpad of all dirt but be mindful of your power button or you may turn the laptop back on while cleaning. Although a dirty LCD will not really cause damage to the laptop it sure can hinder the user’s ability to use it. Cleaning a laptop LCD requires two clean cloths and a very mild ammonia free glass cleaner. 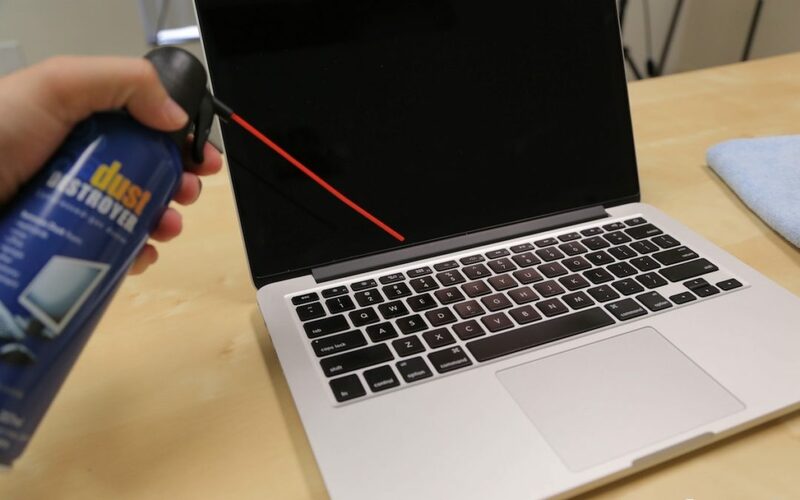 To start dampen one of the cloths with the light cleaner but ensure it is not drip wet as drops of water can find its way into areas of the laptop and cause damage. Start with the laptop LCD open and place one hand behind the LCD to brace it then with the other hand use the dampened cloth and lightly wipe in a circular motion around the LCD screen. Start with as light of pressure as possible for the first clean and then follow through with a 2nd clean with slightly more pressure but keep in mind the LCD screen should be treated like a old pane of window glass….although you can use some pressure while cleaning it is recommended you treat it as fragile glass. The dry 2nd cloth can be used to buff any streaks out that may have been caused by the drying of the cleaner. Use your breath to apply a small amount of moisture to the LCD areas with streaks will help in the removal. Blow as much dirt and dust off the LCD with air before cleaning with cloth..
Never spray the laptop LCD with cleaner, spray the cloth. The cleaning cloth should be only lightly damp. No water drops should come from the cloth when rung out. Brace the back of the LCD with your free arm to take the pressure of the LCD hinges while cleaning. Start with a light pressure clean and if needed apply a 2nd cleaning with slightly more pressure. Remember many streaks and LCD blemishes will not be seen once the LCD is in use. Clean the dust off before cleaning anything sticky with a damp cloth. Never spray the laptop keyboard with cleaner, spray the cloth. Q-tips work great for keyboard key cleaning and will help avoid snapping keys off. At Waco iPhones we recommend laptop cleaning every 3-12 months depending on your working environment. Laptops that see constant use daily in a warehouse, facility or other dusty environment may require cleaning every 3 months but a laptop in a modern, clean house that is only used recreationally from time to time may be able to go a year. – For Laptop Repair please see our Laptop Repair Page.